ParkMe (formerly Parking in Motion) eliminates the hassles out of parking. Today, ParkMe, the leading provider of parking information to drivers, navigation companies and smartphones, announced it has renamed its app, ParkMe, overhauled its design and added new functionality that directs drivers to the best available parking. The ParkMe app, formerly named PIM, has been significantly streamlined and now includes proprietary technology that shows drivers the best parking locations around their destination based on cost and proximity. With one-click and makes it much easier for a driver to find the optimal parking space. The app also has a new “rate calculator” feature, which automatically calculates the total price of parking based on the amount of time a driver would like to stay. Available in 500 Cities, ParkMe is now available in Austin - just in time for SXSW. "Navigation is a great tool for motorists, but until now, parking was the missing piece of the puzzle – though it is often the longest part of our journey,” said Friedman, co-founder and CEO of ParkMe. "ParkMe saves drivers time, money and frustration." Today, ParkMe (formerly Parking in Motion), the leading provider of parking information to drivers, navigation companies and smartphones, announced it has renamed its app, ParkMe, overhauled its design and added new functionality that directs drivers to the best available parking. The ParkMe app, formerly named PIM, has been significantly streamlined and now includes proprietary technology that shows drivers the best parking locations around their destination based on cost and proximity. Rather than showing every possible location in a given area, ParkMe simplifies the process with one-click and makes it much easier for a driver to find the optimal parking space. The app also has a new “rate calculator” feature, which automatically calculates the total price of parking based on the amount of time a driver would like to stay. In addition, ParkMe announced it has expanded into the Austin market – just in time for SXSW. ParkMe is already available in more than 500 cities in the U.S., Canada and Europe. Within these cities, ParkMe covers all the municipalities’ public parking facilities and privately owned lots in the urban core. For more information about ParkMe, go to http://www.parkme.com. Based in Los Angeles, ParkMe is the leading provider of parking information to navigation companies and smartphones. Its mission is to make parking easier. ParkMe collects and aggregates data about both on-street and off-street parking and has built the world’s most comprehensive parking database. This includes more than 25,000 worldwide locations in more than 500 cities, 19 countries and 3 continents. 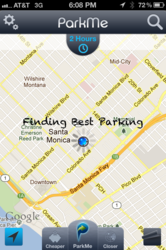 ParkMe’s free app, ParkMe, helps drivers find parking in real-time from their smartphones. ParkMe is backed by a highly respected group of investors, including Fontinalis Partners and IDG Ventures. Fontinalis Partners is a leading transportation technology strategic investment firm founded by Bill Ford, Ralph Booth, Mark Schulz, Chris Cheever and Chris Thomas. IDG Ventures is a global network of venture capital funds with approximately $5 billion under management and a portfolio of over 220 companies built over the last 15 years. For more information about ParkMe, please visit: http://www.parkme.com.